What can we learn from photographs of Happenings? In my childhood, a picture of my great-grandmother Märta Ehn’s wedding in Delsbo, Sweden, hung in my parents’ hallway. Or, rather, what I thought was my great-grandmother’s wedding. I later learned the depicted event was a staged “bondbröllop”, or peasant marriage, likely in 1902, during a period when Sweden saw a revival of interest in folk culture. The 16-year old Märta, my great-grandmother, played the part of the bride. Although its provenance was invisible once hung in the hallway, this photo came from the archive; our family didn’t know of its existence until, by chance, my uncle and grandmother saw it while visiting a museum in Sweden in 1985. Until this chance encounter, the museum archivists didn’t know whom the photograph depicted. Our family received a copy, which hung in the hallway of my parents’ house, where I was able in subsequent years to misunderstand it, seeing in those traces of silver nitrate a depiction of something that had never actually happened. I can still recall my surprise at learning my mistake. The lesson that I learned from this experience was to look more closely—and not to presume. Using photographs as documents of historical performances, whether a marriage or performance art, requires more than just a casual looking-over. A failure to ask methodological questions at the onset can result in naïve readings such as the one I made of the bondbröllop, in which, based on a few cues from the image, we populate the picture frame with preconceived notions and ideas, rather than actually learning something. This amounts to what Barthes called our unfortunate predisposition to see in photograph only the “sens obvie,” [Barthes 1991: 45] the “obvious sense” that jumps out at us as if we were merely glancing down the street. In fact, more aptly, one might say that this sense jumps into the picture, as it has less to do with a particular photograph, and more to do with our own beliefs. If we are to avoid this “obvious”, often erroneous, and always diminished interpretation of a photograph’s meaning, we must in effect struggle against our tendency to come to conclusions too early. But how to see as much as possible in a picture, how to see more than I already knew? This was a central question I confronted while researching Allan Kaprow’s Happenings and Environments. This article presents my answers. In order to approach photographs as primary sources, and not simply as illustrations of our own preconceived ideas (as they are most commonly used), I draw upon theories in iconology and semiotics, which I enlarge by considering specific qualities of the photographic medium and the entanglement of the photographer in the performance itself. These can provide us with a theoretical backbone, and a series of provocative questions to hold the obvious at bay. Transfer took place at Wesleyan University, during three cold February days in 1968. Student Andrew Glantz was hired to take photos. Along with the score, preparatory letters, and notes about the Happening-to-be, the Getty Research Institute Special Collections preserves two of Glantz’s contact sheets of 12 images each and a collection of roughly 25 prints, some of which are of images visible on the contact sheets. I will show how these photographs, with help from questions inspired by semiotic and iconographic theory, can aid our historical insight about the performance, providing insights not available in the textual accounts. By comparison to texts, which are produced comparably slowly and may be made before, during or after the performance in question, photographs typically capture only a brief moment while the show is underway. Such was the case with Transfer. Afterwards, as Transfer also typifies, pictures are most often used as illustrations to accompany textual descriptions. They rarely function as sources of information. Instead, they tend to be used, rhetorically, as arguments of presence, authenticity or tangibility (a function ironically close to Benjamin’s “aura”). Using photographs as proof rests on what Charles Sanders Peirce would call their “indexical” aspect. To call them indexical is to say that they were produced through physical contact with the object to which they, as signs, refer. Indexes are signs which bear the direct mark of the thing for which they are meant to stand in. That is to say, photographs, footprints, thumbprints, fossils, and signatures all have indexical qualities. Indexes are one of Peirce’s famous trio of index, icon and symbol (which, in this essay, I will use in his senses) [Peirce 1955: 107]. Indexicality, as Peirce explained, is not an absolute quality of real signs. It designates a spectrum, and it is worth noting that photographs can be considered indexical principally to the extent that they appear generally more indexical to a particular event than some other documents at hand. Accordingly, the first step is to evaluate indexical believability. For Transfer, it seems the images were not substantially altered after the time at which the negatives were exposed, with the exception of cropping and changes in contrast. I concluded this based on the material facts of printing techniques of analog photography in 1968, but also on the similarities I found between the contact sheets and the final prints, my knowledge of the documentation of Kaprow’s other works, and my conversation with Glantz himself. Large heap of metal barrels behind chemical plant. People pose among them for triumphal photo. Barrels loaded onto trucks, driven to another site. Unloaded. Stacked neatly. Sprayed silver. People pose for triumphal photo. Barrels loaded onto trucks, driven to new site. Stacked neatly. Sprayed white. Triumphal photo taken. Barrels trucked to new site. Stacked. Sprayed black. Triumphal photo. New site. Barrels stacked. Da-glo red. Triumphal photo. New site. Barrels stacked. Da-glo green. Triumphal photo. New site. Barrels stacked. Silver. Triumphal photo. New site. Barrels stacked. White. Triumphal photo. Back to chemical plant. Barrels dumped. Black. Triumphal photo. While the photographs of the event depict a brief (and unrepeatable) moment at one particular place, the score for the Happening has a general and thus generative character. In reading the score, we can thus, for example, imagine two sequences of events that it describes, yet which are nonetheless different. In fact, two people performing the score would never make the same performance, as they would select different barrels, participants, paints, and sites. John Cage, famous champion of indeterminacy and briefly Kaprow’s teacher, noted as much in the 1960s. This generativeness is in fact the most basic layer of “openness,” designated by Umberto Eco in 1962 [Eco (1962) 2006: 22] as the inevitable fact of interpretation. Were we to use a photograph as a basis for reimagining the event, it would on the contrary be necessary to project our reconstructions beyond the temporal bounds of the image, as each image only contains a slim and specific extract of a fragment of Transfer. The distinction between the general character of texts and the specific character of photographs is perhaps most acutely understood when one is attempting to secure permission to publish materials under copyright. Authors are free to paraphrase texts and draw citations from works free of cost in the United States under the statute of Fair Use. However, in reality this proves impractical with photographs, which, unlike texts, must in most instances be reproduced in full when cited. While texts can be paraphrased, photographs cannot be “translated” into a second yet nearly equivalent image. Doing so would not only prove formally difficult, but also sever the indexical connection to a particular time, place and scene, eliminating what is often seen as the most important aspect of a picture. For example, a picture of strangers posing as one’s parents, mimicking a lost picture from years past, would usually not be as effective at awaking childhood nostalgia. Despite (or perhaps because of) the specificity of photographs, we can fall into many interpretative traps. In some instances, this deceptiveness is consciously built in to an image by those who made it. Yet the pitfall that is the most difficult to avoid is the simple projection of our own assumptions, ideas and beliefs—the “obvious sense.” The complete avoidance of this sense would be both impossible and counterproductive, but its presence is problematic. It is by knowing a thing that we can recognize its image; but we tend to recognize the known even when confronted with something new. By serving as guides to remind us where, in images, we should look, helping us separate ourselves from too-easily projected categories, semiology and iconology enable us to notice more of images’ content, perform better analyses, and synthesize a broader understanding. In Peircian terms, making what Panofsky called a pre-iconographic description is thus to treat a photograph as a complex iconic sign. Icons are signs which we link to their referent by virtue of a natural resemblance. Seeing Peircian icons relies on our past experience of the objects to which they refer, and analytical effort is thus necessary when the scene depicted is unfamiliar. In Panofsky’s example, an image may be made up of colors, which we subsequently recognize as a representation of a person (perhaps a deferential one, or perhaps a happy one) lifting a hat, simply by virtue of our ability to believe in the illusionistic picture plane. When we identify “a person with a hat,” we can only do so because we are familiar with people, hats, and lifting. A pre-iconographic (iconic) description extracts an (indexical) testimony to the presence of materials or actions, and in this case lends specificity to the scripts’ common nouns. How many people are visible in the photograph? Was Kaprow one of them? What were they wearing? What props are visible? Were there spectators? What was the weather like? 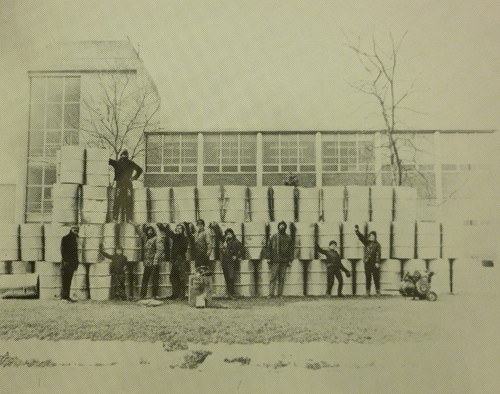 Which kinds of barrels were used? Did people stop for a snack? “Pre-iconography” reminds us to look at all the flat “forms” of silver nitrate, consider how they may be interpreted as icons, and ask questions that emerge from the very images. This process of “close reading” may result in peculiar discoveries, as our eyes stray to the forgotten corners of a print. 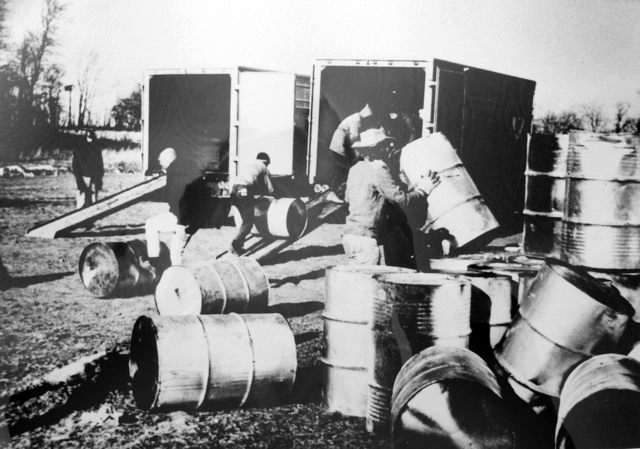 In one poor-quality photograph of Transfer, six people appear to be working around a conical stack built up out of approximately 50 metal oil drums, most of which are a dark color but several of which may be white. 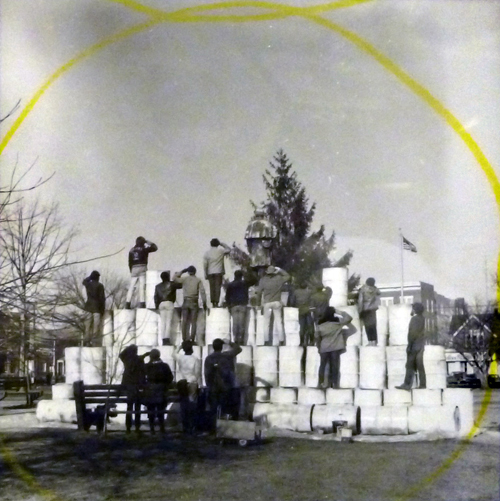 The six people, including Kaprow, who is visible second from the left, are unrolling two rolls of white material in which they have already wrapped two or three barrels. Kaprow is holding something that may be a roll of tape in his right hand. They appear to be applying this material to another barrel at the time of the photograph. All six figures are in movement. None look at the camera or acknowledge the photographer. They are working on what may be a parking lot or other flat surface. They are all wearing jackets, and one may be wearing a hat. The four figures on the left are relatively slim and wearing fitted pants, whereas the other two are harder to distinguish. In the background is a large, darkly-colored, windowless structure that may be a commercial building. Further away, a street lamp or telephone pole is visible, and beyond it a building and a few unrecognizable medium-sized objects on what may be the other side of a street. Shadows are cast towards the lower right-hand corner of the photograph, indicating that the photographer was looking partially into the sun. The sky is a uniform and light color. The black barrels are shiny. No other people are visible. If we knew nothing about Transfer, we could already ascertain a great deal. 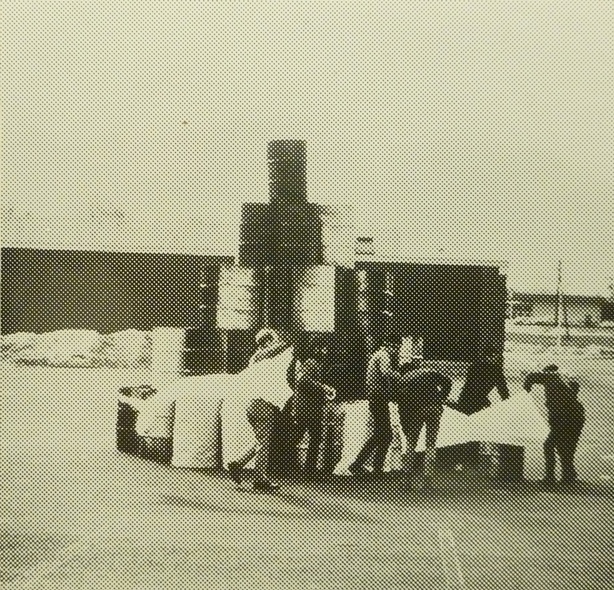 The event involved cooperative work in order to construct a conical stack of oil drums, after which each barrel was subsequently wrapped in some light-colored material that was perhaps affixed with tape. It was cold. Kaprow participated with the others. At least six people participated, and a photographer, who appears to have documented this particular instant without calling for the performers to stop and pose for the camera. If there were spectators, they are not visible. In fact, the landscape is quite desolate, and the event took place in what may have been a remote and unpretentious location. Furthermore, the print bears the traces of its own path; the texture makes clear that this image was printed through a dot-matrix process commonly used for mass production, and that Kaprow received a copy. The score (and most descriptions) omitted nearly all of these historical facts. Most puzzling is the wrapping of barrels in some unknown, rolled material, as this action can not be found in the score. Why did the Happeners divert from the plan? Was this unscripted action one of practical necessity, or an indication that the archival score is in fact not the final draft, or a last-minute, improvised aesthetic addition made by the group itself? The picture can raise this question, but it was only by interviewing Glantz that I found an answer, when he reported that one of the paint colors had failed to adhere as a result of the extreme cold. Furthermore, pre-iconographic description has uncovered a formal decision: the arrangement of the oil drums in a conical form. Not only are photographs never instantaneous, but they can even show us movement beyond the bounds of the brief time they directly depict. Movement is pictured, and can also be interpolated or extrapolated. Shutter speeds are always measured in durations. For practical purposes, photographs tend to depict a period of time ranging from 1/30th to 1/1000th of a second. On the slower end, movements are indexically captured by blur. When observed under a loupe, many photographs can actually show us in which direction objects or people were moving during the brief period which the photograph shows. Peirce’s other kinds of signs –icons and symbols– can also picture movement. Consider (as an icon) a picture of rain falling, Yves Klein’s famous jump into the void (were it not staged), or a view of Transfer in which a barrel hangs in mid air. Or (as symbol) an image of a 100-meter dash about to begin. If the photograph has not been reworked, it is only in the case of symbolic representations that no movement necessarily occurred; the 100-meter dash may have been cancelled at the last second, but the barrel certainly fell down (and, likely, with a crash). The limit case of multiple photographs is a film. The very fact that films successfully appear to us as “moving pictures” shows the efficacy of the unconscious ability to interpolate motion between two images. Multiple photographs, which with luck appear in chronological order, can help us reconstruct movements between distinct performance states. In some instances, actual speeds can be calculated. We can also attempt to find a more generalized logic to the event itself, uncovering the manner in which objects or events related to one another and changed over time. The contact sheets which Glantz printed show two photographs of most triumphal poses. Despite the fact that the images are small, details are lost, and their state of preservation leaves something to be desired, we can nonetheless compare them. Between each pair of nearly-identical views, the aperture and shutter speed are unchanged, suggesting that the purpose of taking multiple exposures was not to ward off under- or over-exposure, but rather to provide an aesthetic choice. Glantz (who was apparently holding the camera by hand) didn’t move substantially between the two, but those who posed did, showing that at least 15 seconds lapsed between photos, as seen in these images of the seventh triumph (between which one person actually leaves the composition in order for another person to step in). The general gesture made by each member of the group, however, remains unchanged. This consistency suggests another element of compositional process not described in the score: the group was acting as a coordinated unit, selecting a common pose for all performers, and only one pose per site. It remains unclear if the pose was designed collectively, by Kaprow, or by other individuals or sub-groups. 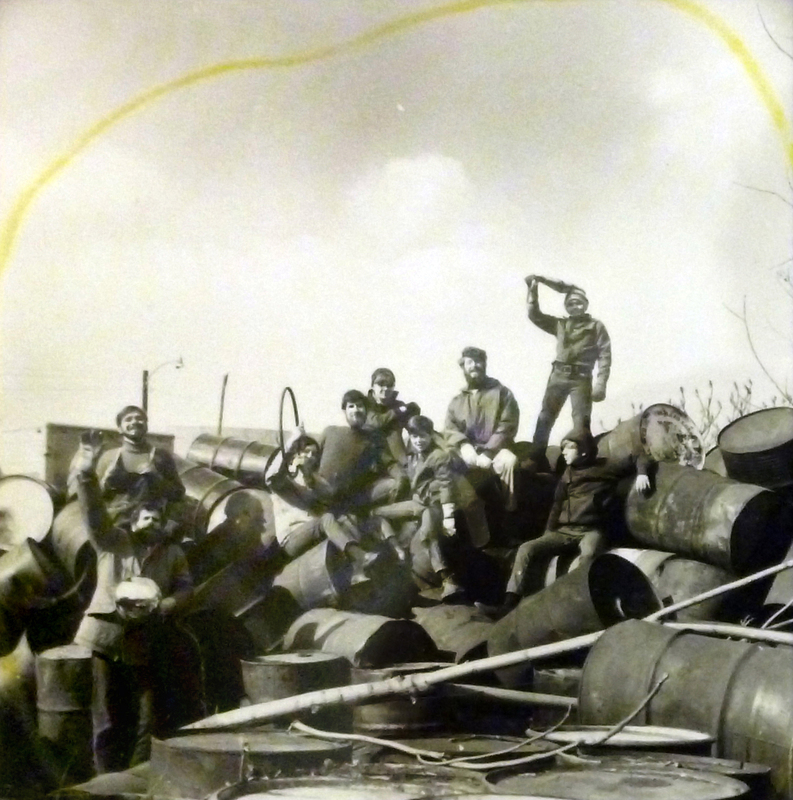 In only one triumph was there no coordination: the first one, in the dump where the barrels were collected. Here, many people, including Kaprow, changed their gestures between the two images. The photographs thus suggest that this group coordination –and the goal of varying poses– developed during the Happening itself. We can always find time in still photography. In some instances, such as the two views of triumph seven, we can forensically reconstruct speeds or rhythms, and, in others, such as triumph one, we can describe the logic at play behind the transformation between two states. Through this comparative approach, it is clear that only one triumphal pose was chosen for each performance site, and that the unity of this pose, which increased as the Happening went on, was worked out during the performance itself. Like our discovery of unscored material during pre-iconographic description, this comparative analysis has turned up new information about the way in which the script was brought to life. On top of this literal layer of pre-iconographic description comes that of analytical iconography. What Panofsky calls “iconographic analysis” [Panofsky (1939) 1972: 11] is the process of uncovering conventions within picture-making, and requires that we seek generalizations that hold for a wider range of pictorial evidence. Iconography must be constituted comparatively. Panofsky sees iconography as the search for “motifs,” representations that have a life-span across multiple works and multiple times. In Peirce’s terms, these are symbolic signs, but built out of icons and thus iconic as well. Symbols, by contrast to indexes and icons, have a conventional or historical association to their referents. This makes them quite culturally specific. For example, spitting on someone’s head can be a symbolic act; such a gesture in England would be an insult, but in Greece would be a wish of good luck. Panofsky notes that “formal analysis” [Panofsky (1939) 1972: 14] also engages this symbolic level to an extent. Formal analysis is the uncovering of formal (which is to say, pre-pre-iconographic) relationships between icons on a picture plane, often relationships which can exist on the physical, two-dimensional surface of a painting even as they fail to exist in the illusionistic space that a tableau depicts. Formal analysis provides a different result with photographs than with paintings. Paintings are highly deliberate, and iconographic analysis can thus in theory uncover a wide variety of conventions that ruled the painter’s decision process. Production of photographs, by comparison, has a larger share of contingency; they are produced to a greater degree despite the intentions of those behind the camera, who acts more as a curator and less as a composer, and their indexicality is greater than paintings. That is to say, it has historically been harder to paint an illusionistic scene with accidental character than to snap a picture without knowing what it depicts. Applying analytical iconography to photographs thus reveals not only symbolic conventions about image composition, but also symbolic gestures that have anthropological value, and, in the case of performances, broad formal choices that took place during the event. The image of triumph seven shows a clear formal analogy between the stacked barrels and the building in the background. The overall shape of the barrels mimics the nearby building, a lying-down “L” that also corresponds to the physical distribution of the performers’ bodies. Happeners must have chosen this coordinated stance in correspondence with variables in the physical site, as several other triumphs contain similar formal echoes, in which objects found in the surroundings were used to determine how the barrels were stacked and how the people posed. This “formal analysis” tells us little about Glantz’s compositional beliefs, but is intriguing testimony to the integration of environmental variables into the realization of the script. In triumph three, the environment is again used to determine compositional choices, but this time through symbolic engagement, rather than a formal analogy. Happeners stood, their backs to the camera, atop a skyline-like configuration of barrels, painted white and stacked as many as four high in uneven, tight-packed walls. All persons, identically posed, saluted in the direction of the furled-out American flag, visible in the distance beyond the barrels, a bronze statue (whose rear they faced), and a tree. Several unstacked barrels, also painted white, lay in a line on their sides on the ground nearby. Three Peircian symbols can be identified: The American flag flies face-forward in the background (a sign of the nation), the Happeners are saluting (a sign of military deference), and the Happeners and statue are visible from behind (a sign of indifference to the cameraman). Each of these symbols has a conventional and malleable meaning. Are the Happeners showing their deference to the statue, or mocking it? Why have they taken this picture from the back, as opposed to from the front? Does this image tell us about the group’s collective beliefs about the nation and patriotism? The photograph documents a clear thematic engagement, even if answering these questions fully requires a broader study of the meaning of these gestures at this particular time and place. If the triumphal poses are particularly clear objects of analysis, it is because moments of clarity-for-the-camera were scripted into the score of Transfer. Even when photography isn’t required by the composition itself, the presence of a photographer and photo-documentation shape performances. The camera, like any aspect of a performance environment, is a thing to which performers respond. Images preserve the event, and making images serves as a constant reminder that the performance actions are embedded in –and possibly important for– history. Later, when performances are remembered, it is often through photographs that their meanings and value are perceived, shaping their reception in the popular and specialized press. Our understanding of how the act of recording participates in creating that which it records changed dramatically over the twentieth century, as we transitioned from what historians of science Lorraine Daston and Peter Galison [Daston and Galison 2007] have termed the era of “mechanical objectivity” into that of “haptic objectivity.” Believing in mechanical objectivity –an idea of Peirce’s time– meant believing that images produced by cameras are objective visual documents, and that they represent the “external” world better than our understanding ever could. Haptic objectivity, on the other hand, reflects a newfound appreciation of the extent to which the process of making images also plays a role in determining the final form of the images themselves. This was a broad-based shift; a lab physicist using an electron microscopes and John Collier might both echo Hans Belting in stating that “photography was once the Vera Icon of the modern,” [Belting 2001: 215] to the extent that we once presumed photographs to be mechanically objective documents. Now, we believe that this sort of unmediated appearance is impossible, not only because photographers make compositional choices when producing images, but also as a result of the fact that the photographer’s very presence, much like measurement by a physicist, alters that which they are seeking to document. This entanglement doesn’t mean photos aren’t documents. What it does mean is that documents, including photographs, were never outside of history looking in, but must always be evaluated as entangled and partial. To what extent did the images made of Transfer change the performance? Beginning with Self-Service in June, 1966, Kaprow often explicitly called for photographs in his Happenings. The camera tended to appear at –and simultaneously define– the highpoints. For example, in Transfer, the apparent purpose of three days of labor was the production of the nine triumphal poses, which is also the only point in the script when documentation is called for. 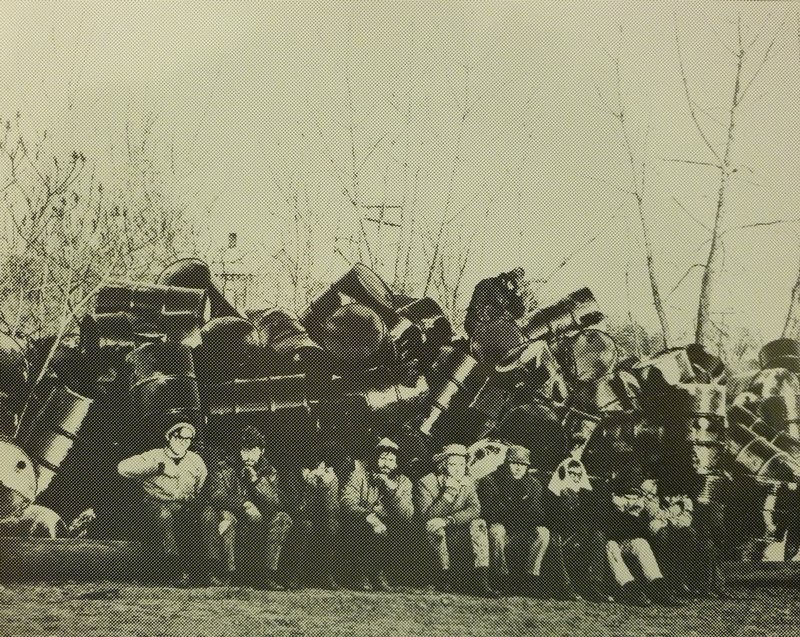 As a thought experiment, imagine that the score instead instructed for the photographer to document the unloading of barrels from the trucks. Would this have led the performers to self-consciously organize during that part of the process, presenting themselves to the camera in factory-style lines, as opposed to showing greater organization during the triumphal poses? It seems highly likely, in any case, that the triumphal pictures are not mere records of a performance that would have happened even without the photographer. That the performance was to be documented at that particular juncture also resulted in shaping performers’ comportment by signaling to the group that this was the moment at which they should present themselves (indeed, collectively organize themselves) visually. Glantz’s photographs doubly reflect the belief that the triumphal poses are the most important visual moment of the performance. While the Happeners, excepting for the first pose, organized themselves for the camera, Glantz, in turn, centered and focused his compositions in each case squarely on the group. The distance from which he took the photograph tended to increase as the days went by. In the first photograph, in which no common pose was established, Glantz stood quite close, but by the time of the seventh and eighth triumphs, the performers and sculpture came to occupy only roughly the center eighth of the picture plane. Whereas the first image thus has a somewhat personal feel, the increasing distance lends the group greater visual cohesion as a single block within a larger field. This increasing distance may thus reflect a growing willingness –of Glantz’s and of the Happeners– to play along with the idea that the triumphal photographs are meant to be something grand, an action which the group undertakes in a wide landscape. By contrast to the triumphal images, when Glantz took candid pictures, none of the workers interrupted their tasks in order to smile at the camera. Most people work alone, or in pairs. With no poses to unite them, it seems harder to generalize about these views of performance-in-action. But this absence is itself information; it shows that the group apparently acted together most markedly during the poses staged for the camera, and that, at other times, individuals were more dispersed. Since the first action still, depicting the off-script wrapping of the barrels, is the only exception to this dispersion, we might speculate that group coordination and unity occurred when the script failed, and decisions (as to which pose to take, or how to make paint stick) had to be made. As a result of the entanglement of photography, it is difficult to imagine its impact in this performance. Nonetheless, the very presence of the photographer contributed to a heightened organization during the pose, and thus participated in the development of sequentially more grandiose triumphs, and the peculiar alternation between performers generally acting as individuals or small groups (while working) and as a group (while posing). What about the subsequent use of these photographs? Tracing their history backwards shows that their circulation has been far from straightforward. The most recent reproduction which I have encountered I found on artnet.com in 2012. There, a rephotograph depicted a series of five prints offered for sale. Each individual print visible in this online image was itself printed on paper measuring 44 x 42 inches. One bid was made, but the reserve was not met. The estimate was 50,000-60,000 dollars. Of the five, two are triumphs, and three are candid portraits of students working, of which two show painting and one shows stacking. All five views can also be found in the Getty archives, although their prints are much smaller. Each print has a small piece of paper with a title and Kaprow’s signature. Although the prints are large, they are of rather poor quality, and strange pieces of text appear on the silver-nitrate paper just outside the frames. This is because these blow-ups are in fact rephotographs, produced by the Galerie Inge Baecker in Bochum for Kaprow’s first show there in 1970. Suspecting that it would be advisable to familiarize the gallery visitors with Kaprow’s earlier Happenings, Baecker arranged for a selection of such documentation to be hung on the walls. The source material for these blow-ups, which we might suspect by the Ben Day dot matrixes they present, was Days Off: A Calendar of Happenings, printed by Wood & Jones for the Junior Council of the Museum of Modern Art in New York earlier in 1970. This “calendar,” which looked like a large block of paper bound at the top, only included a selection of actual calendar dates. These were dates on which Happenings had occurred, and, for each of them, a page or two was made up, including a largely printed date (with no year), score text and, more prominently, photographic documentation. Transfer is depicted on nine pages, each of which shows one triumphal photograph, and some of which have views of the process as well. The fact that the Baecker prints were made from this source material resulted in their looking somewhat like glorified microfiche reproductions, as each blow-up of a photograph also contains bits of oddly cropped text and, sometimes, other photographs hanging off the edges of the paper. Perhaps Kaprow appreciated this sort of historicizing use, as he later sent a copy of Days Off to the Centro de Arte y Comunicación in Buenos Aires as his participation in a show in 1973. The images for Days Off had been chosen by Kaprow, and we can see his process in the way he hastily marked up the contact sheets that Glantz had sent him. Peculiarly, many of the views that Kaprow selected were candid, despite the fact that Glantz recalls that he was hired only to produce the triumphal pictures, and that it was his choice to take extra photographs of the process as well. While each of these uses the same images, based on the selection that Kaprow made from Glantz’s contact sheets, the function varies substantially. Glantz’s contact sheets served the purpose of allowing for Kaprow to select which images would represent the event (and, simultaneously, for Glantz to sell Kaprow the requested prints). The images in Days Off, by comparison, were part of a document offered for sale to a museum-going crowd likely familiar with Happenings. Kaprow saw the calendar as disposable, and intended it to function as an incitation to engage in Happenings and play. The blow-ups of Days Off, in turn, were used with the aim of contextualizing Kaprow’s current work for a new, German audience. They did so in a grander manner than the calendar would have, as they are made out of better quality paper, are of a larger size, and were signed. Somewhat ironically, the artnet.com images, which are in fact the most removed from the performance indexically, depict these blow-ups as auratic objects by emphasizing this signature. The images visible online are in fact photographs of C-prints of photographs of an offset print that was itself based on a print made by Glantz from a grainy Kodak Tri-X negative, which was since destroyed in a flood. Condition assessment photos of signed photos of discardable photos of documentary photos. All of these uses testify to how photographs can circulate, and show that one and the same photograph can be invested with a variety of meanings in different contexts. Each emerges from wider, historically evolving beliefs about the possible uses of images. Days Off testified to Kaprow’s desire that the images lead to creative ideas and leisure time; the blow-ups used the images as precedent to confer historical weight to Kaprow’s early 1970s work; the online pictures serve to remind us that the cult of the author and the art market are alive and well; and my own use attempts to show how these images can be used to bring us closer to an understanding of the performance in which they were produced. Seeing intrinsic meaning requires studying a wide range of images, from between which such a comprehension, aided by more general historical knowledge, may emerge. [Ibid. : 5] Although it can be methodologically helpful to perform the thought experiment of drawing conclusions from photographs alone, one usually has other documents to work with as well. In the case of Transfer, for example, the easiest (and most general) approach is through the score, which appears to have been carried out more or less faithfully. One might also interview participants, read other writings by Kaprow and others, or do geographical research by locating the actual performance sites. The wider body of historical artifacts pertaining to the period, including films, literature, politics, and technological changes, might also be enlightening. All of what we have learned through our analyses of photographs of a performance can then be brought together with this wider range of materials, contributing to a larger, synthetic project of understanding a habitus. Panofsky likens habitus with philosophy, by which he means that they are on the same, generative level, regulating the production of paintings by setting the framing conditions, much like Michel Foucault’s “episteme” or Thomas Kuhn’s “paradigm” designate a kind of robust, structuring belief. Judging from their book What is Philosophy, Gilles Deleuze and Félix Guattari would not have appreciated this use of the word “philosophy,” preferring to define it as a kind of complex, inter-textual web, and not a unitary position of origin. Nonetheless, I would like to suggest that you can find a kind of philosophical web in performance events like Transfer, and that work on description, analysis and synthesis of photographic documentation is one way to improve our vision of such an interconnected weave. The mere existence of a philosophical web embedded in the history of performances and ideas doesn’t guarantee it’s value. But its examination can be used for one’s own growth, as a historian and as a philosopher—which is to say, as Kaprow would have appreciated, as a thinker in general. Asking semiotic questions to photographs uncovers historical information not present elsewhere. 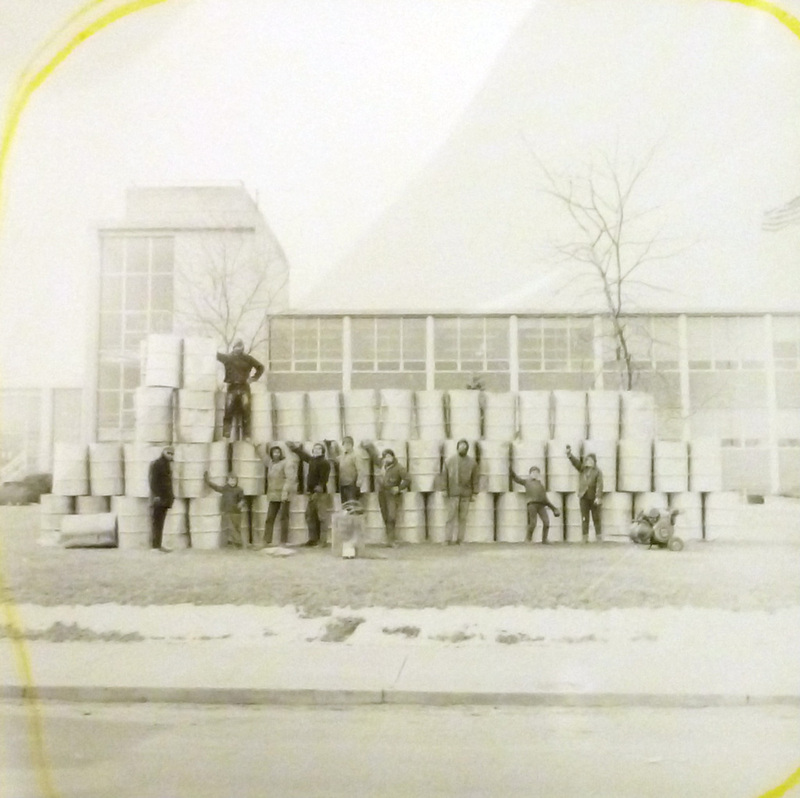 In the case of Transfer, the photographs show that paper was, off-script, taped to the barrels, that the barrels were arranged with a compositional logic responding to the environment, that the poses were collective and possibly collectively chosen, in a way that evolved during the performance itself, that the rhythm of the performance was varied, and that Happeners engaged symbolic gestures and places. Questions of production and reception in turn highlighted the role of photography in forming the triumphal poses, as well as the alternation between individual actions and group unity, and the rhetorical uses which these photographs have served. History is a theoretical entity, built from a body of documentation that we believe lends us some knowledge about a past which we never experienced. Asking questions to photographs, considering their contents as indexes, icons, and symbols, and remembering the entanglement of photography’s production with the performance underway, can help us to develop a more nuanced and broad historical idea, based on observations and analyses that ultimately allow for an informed, synthetic understanding. Perhaps, as Kaprow would have appreciated, this attention can also bring us towards a more philosophical approach to life. Auslander, Philip. “The Performativity of Performance Documentation.” In: PAJ: A Journal of Performance and Art 28 (3) 2006: 1–10. Barthes, Roland. The Responsibility of Forms: Critical Essays on Music, Art, and Representation. Berkeley, CA (University of California Press) 1991. Belting, Hans. Bild-Anthropologie: Entwürfe für eine Bildwissenschaft. München (W. Fink) 2001. Collier, John. Visual Anthropology: Photography as a Research Method. Albuquerque, NM (University of New Mexico Press) 1967. Daston, Lorraine, and Peter Galison. Objectivity. New York, NY (Zone Books) 2007. Eco, Umberto. “The Poetics of the Open Work.” In: Participation. Claire Bishop (ed.). London and Cambridge, MA (Whitechapel Ventures Limited and the MIT Press) 2006. Kaprow, Allan. Days Off: A Calendar of Happenings. New York, NY (The Junior Council of the Museum of Modern Art) 1970. Kelley, Jeff. Childsplay: The Art of Allan Kaprow. Berkeley, CA (University of California Press) 2004. Panofsky, Erwin. Studies in Iconology: Humanistic Themes in the Art of the Renaissance. Boulder, CO (Westview Press)  1972. Peirce, Charles S. The Philosophical Writings of Peirce. Justus Buchler (ed.). New York, NY (Dover Publications) 1955. 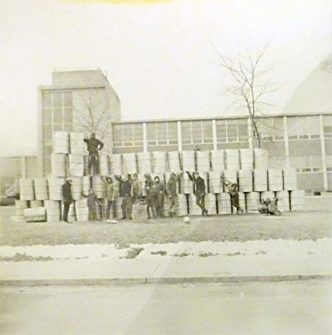 Rodenbeck, Judith F. Radical Prototypes: Allan Kaprow and the Invention of Happenings. Cambridge, MA (The MIT Press) 2011. Zentralarchiv des internationalen Kunsthandels (ed.) Allan Kaprow in Deutschland. Vol. 19. Nürnberg (Verlag für moderne Kunst) 2011. This article was written during a year-long Fulbright Grant in Germany. I thank the Fulbright Commission for their support, as well as Andrew Glantz for allowing me to reproduce the photographs of Transfer, and the Getty Research Institute for preserving them. Peter Moore photographed many of Kaprow’s earlier performances, but what Kelley has called the era of Happenings “on the road” [Kelley 2004: 87] comprised a period in which most performances were documented by a different photographer, often a student, and at times multiple photographers. Glantz was at the time in his first year of what would eventually be a 5-year MA program in Teaching of Art. He now designs and builds sculptural furniture in Scottsdale, Arizona, where he and his wife have lived since 2002. I thank him for sharing his memories of this event with me. For example, Jeff Kelley bases his history of Transfer almost wholly from an interview with Allan Kaprow [Kelley 2004: 130]. The “obvious sense,” upon closer examination, might also be problematically found in interpretations of a glance down the street as well as a glance at a photograph, and its troubling presence in the interpretation of pictures is thus a consequence of its more pervasive presence in interpretation in general. Qualifying a sign as an index (or icon, or symbol) is a relative judgment, in which we essentially take a particular sign to be more indexical than another, as a result of our beliefs or understandings about how it was produced. Rather than having an absolutely indexical, iconic, or symbolic character, independent of an observer, signs are of value only through an observer’s understanding of them. Even though digital photography allows for a wider range of manipulations, the vast majority of images produced during contemporary performances –especially those which are subsequently not used for publication or promotional display– undergo little modification after the fact and thus might be treated as I will treat Glantz’s images. In the very worst case, in which historians believe a photograph to be completely constructed and thus to have lost most of its indexical value, it still functions as a historical document in the manner that a painting does. “Allan Kaprow Papers” [Getty Research Institute, n.d.], Box 14, Folder 1. In fact, it was published by Kaprow himself in Days Off: A Calendar of Happenings in 1970. It seems likely that this print is a proof sent to Kaprow by the publisher. As most photographers will know, the general rule of thumb about the longest duration for which a shutter can be open without causing blur visible to the naked eye is (in seconds) equal to one divided by the focal length of the lens (in millimeters). Composition was the paragon of abilities within the French Academy, and in this case the self-consciousness of painterly activity is obvious. But even later, non-illusionistic examples, such as Jackson Pollock’s drips, were seen to be some form of expression of the painter’s inner self, partly because it is extremely difficult to make a mark with one’s body without knowing generally where it is going. Visual anthropologists employ methods similar to Panofsky’s. John Collier, for example, divides the process of learning from photographs into description, analysis and synthesis [Collier 1967: 203-237]. Collier works under the assumption that the anthropologist is also the photographer, who can then document in a more representative manner. This is usually not possible in performance studies. One method that Collier suggests, which might be of use for performance historians, is “photo-elicitation,” or the systematic use of photographs during interviews. Such use can unlock valuable memories. This statue is part of a war memorial hidden behind the barrels. The memorial, whose central piece is the sculpture by M. H. Mossman, was erected in 1874 in memory of soldiers from Middletown, Connecticut who perished during the American Civil War. Panofsky notes that because the recognition of objects and events in a painting depends on our life experience, it might be “corrected” if we inform ourselves with a “history of style.” [Panofsky 1972: 11] Similarly, a “history of gesture” would allow us to see symbolic meanings beyond the bounds of our own period. Philip Auslander writes that use of photographs as testimony to an event is a question of “belief.” [Auslander 2006: 7] This is because we are incapable of seeing indexicality, but only of supposing it based on our knowledge of how the photographic medium works. Similar problems of believability apply to all historical documents that we assert belong to some event that we did not ourselves witness. It is through everyday experience and the subsequent development of abstract ideas such as causation and history that we learn the bounds of this belief. Judith Rodenbeck has suggested that photography functioned as a central theme for Kaprow during this period, noting that he used other materials, such as aluminum foil, to produce Peircian indexes as well. [Rodenbeck 2011]. “Suite of Five Photographs from ‘Transfer (for Christo)’ by Allan Kaprow on Artnet Auctions,” accessed February 26, 2014, http://www.artnet.com/auctions/artists/allan-kaprow/suite-of-five-photographs-from-transfer-for-christo. Inge Baecker, interview by Eric Morrill, February 16, 2014. These photographs can be seen in a recently published photograph of Kaprow’s first Bochum opening in Baecker’s gallery’s first location, a spacious underground garage belonging to her parents. Zentralarchiv des internationalen Kunsthandels (ed.) 2011. Days Off, by presenting the scores with photographic documentation, is an intermediary step between the earlier, text-only scores that Kaprow published through Great Bear Pamphlets and the later Activity Booklets, in which scores were accompanied with staged, illustrative photographs. On the first page of Days Off, Kaprow instructed purchasers that “This is a calendar of past events… Each day is a page, or more, that can be taken off and thrown away. … As the calendar is discarded like the Happenings, the gossip may remain in action.” [Getty Research Institute, n.d., “Allan Kaprow Papers,” Box 15].